Nancy Shevell biography. Who is Lady McCartney? Home Entertainment Nancy Shevell biography. Who is Lady McCartney? Nancy Shevell is the third wife of Sir Paul McCartney and the daughter of an American trucking magnate. Nancy Shevell, 51, the New York millionairess, started dating Paul McCartney in November 2007 and it was announced on 6 May 2011 that the two had become engaged. Nancy Shevell’s birthday is in November 1960. She was born to Myron and Arlene Shevell with a brother Jon and sister Susan in Edison, New Jersey. Her father, Myron Shevell is a head of a trucking firm, New England Motor Freight. Nancy Shevell and Linda McCartney, Paul’s first wife, were pals. Nancy was diagnosed with breast cancer in her 30s, around the time Linda was losing her battle. The two women became then close friends. Nancy Shevell is a breast cancer survivor. Nancy and her ex-husband Bruce Blakeman knew Paul McCartney, his wife Linda and the children when they visited the Hamptons where Linda had family. Nancy Shevell was married to Bruce Blakeman in 1984, having a son, Arlen Walters, in 1992. Nancy Shevell officially divorced her husband of 23 years, Bruce Blakeman, a powerful lawyer, in December 2008. Supposedly, their break up was amicable and mutual. Nancy Shevell has been dating Paul McCartney since her separation in November 2007. She was first caught giving Paul McCartney a kiss after his split from Heather Mills at her luxurious hideout in the Hamptons. According to her official biography, Nancy Shevell serves as Vice President of Administration at Shevell Group of Companies, L.L.C. Nancy Shevell also serves as a Vice President of Administration of The Shevell Group and its subsidiary, Carrier Industries, Inc.
Nancy Shevell has been Vice President of Administration of New England Motor Freight, Inc., a subsidiary of Shevell Group since 1986. Nancy Shevell is responsible for accounts receivable, corporate communications, benefits administration, purchasing of all supplies and equipment with the exception of trucks and overall office management. She joined NEMF in 1983 as Manager of Administration and served as its Director of Administration until 1986. Nancy Shevell is a Co-Chairperson of the Arlene Walters Shevell Endowment Scholarship Fund. The new Lady McCartney is active in numerous other charities and public interest organizations. She has been on the MTA Board since 2001 as an appointee of former NY Governor George Pataki. Nancy Shevell was appointed as Chairperson of the Capital Construction Committee of the Metropolitan Transportation Authority in 2004. She was the recipient of the Fred Harley Memorial Scholarship for Excellence in Transportation. Nancy Shevell holds a Bachelor’s Degree in Business Administration from Arizona State University, where she majored in Transportation. 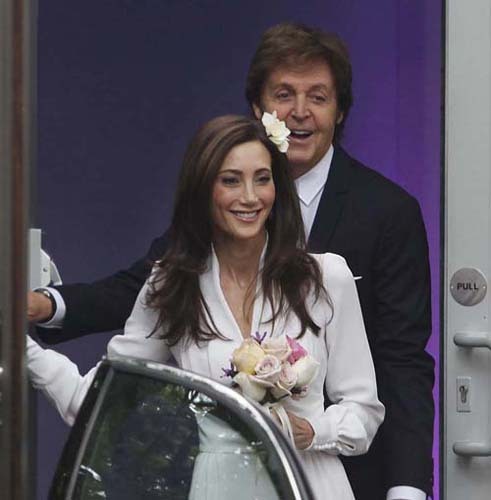 On 9 October 2011, Paul McCartney and Nancy Shevell married at Old Marylebone Town Hall in central London, where his first wedding with Linda eastman took place in 1969. According to reports, the couple attended synagogue services the day before out of respect for Nancy Shevell’s Jewish heritage. Upon their marriage, Nancy Shevell became Lady McCartney. how old is paul mccartney's new wife? what is nancy shevell's birth date?